← The Starting Lineup: Wizards Win! Wizards Win! Wizards Win! What about Ivan Johnson? On the court he looks pretty scary. Ivan can be super laid back, real cool. Actually, we did yoga this morning. Me and him together. But, if you, like, make fun or say something he doesn’t like, he can get in your face. He can step up to you. Whose idea was it to do yoga? Well there you have it! 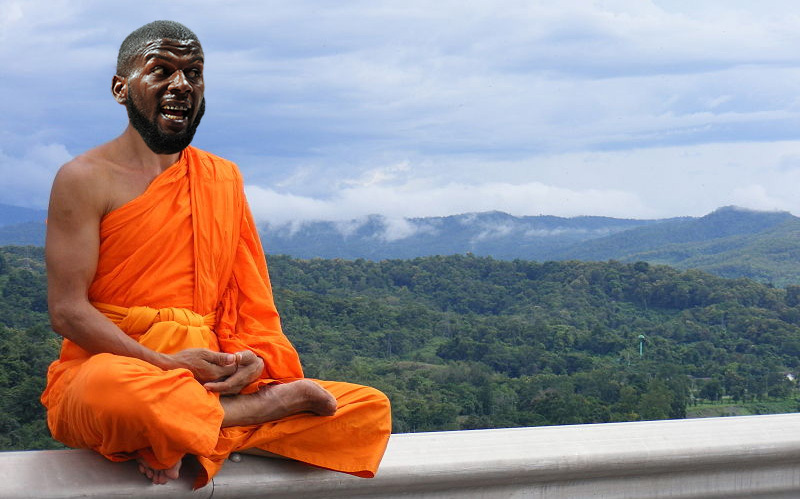 Ivan Johnson — the scariest player in the NBA, who is banned for life from the Korean Basketball League, has shattered a backboard, and flips the bird at approximately one third of all people he encounters — has practiced yoga at least once, presumably whilst wearing his diamond-encrusted grill. If knowing that doesn’t make you at least a little bit happier than you were before then I’m honestly not sure what I’m even here for. By the way, Ivan, sir, if you happen to see this just know that I am most certainly NOT making fun of you. I’ve done yoga myself, multiple times! I think it’s absolutely fantastic, and… please don’t hurt me? !